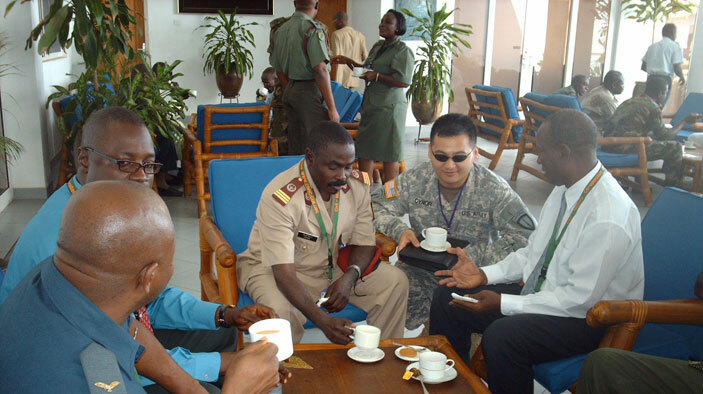 The U.S. Africa Command’s Operation Enduring Freedom—Trans-Sahara and DAI conducted this innovative civil-military operations/relations (CMO/R) education program to support the interagency Trans-Sahara Counter Terrorism Partnership (TSCTP). This multiyear U.S. Department of Defense training series supported the U.S. Agency for International Development and U.S. Department of State’s joint effort to build civil-military capacity and enhance regional security and cooperation. Our program conducted eight to 10 CMO/R training events per year to foster continuous learning for key civil-military leaders from Burkina Faso, Chad, Mali, Mauritania, Morocco, Niger, Nigeria, Senegal, and Tunisia. The TSS three-tiered curriculum gave participants a platform for progressive learning as well as continuous key leader-engagement opportunities. Coordinate between military and civilian authorities in countering irregular threats such as transnational criminal groups and transnational terrorist activity. Inform and advise their organizations on security sector stakeholders, roles, and best practices. Build capacity of interagency and regional partnerships to counter extremist elements’ ability to exploit crises. Identify actionable early warning mechanisms and conflict triggers. Increased the capacity of North and West African partner nations to use enhanced CMO/R to counter threats to human, national, regional, and international security. Annual country-specific training in each partner country highlighted how 21st century irregular threats affect national stability. Semiannual training brought together select TSS graduates of country-specific training from the eight participating nations to discuss regional irregular threats, emphasizing collaborative responses to security challenges. The Senior Leader Symposium brought together outstanding alumni each year to engage regional organizations and partners in collaborative efforts to address regional security challenges.